In a way, 'Trash' by Andy Mulligan is an adventure story. Three boys out to uncover a mystery, much like the Famous Five! But instead of living in a quaint little English Village, these boys live in the squats of Behala. Sifting through other peoples rubbish to find anything worth money. Behind the adventure and excitement of the story is the stark reality of the terrible conditions in which some people live. The book also focuses heavily on police and government corruption, exposing how difficult it is for people in this situation to get out. Of course this is a fictional book, but we have all seen the appeals on the television, children on rubbish dumps living in squalor. This is real! And I feel that Mulligan does a good job of bringing the situation to life in his book. 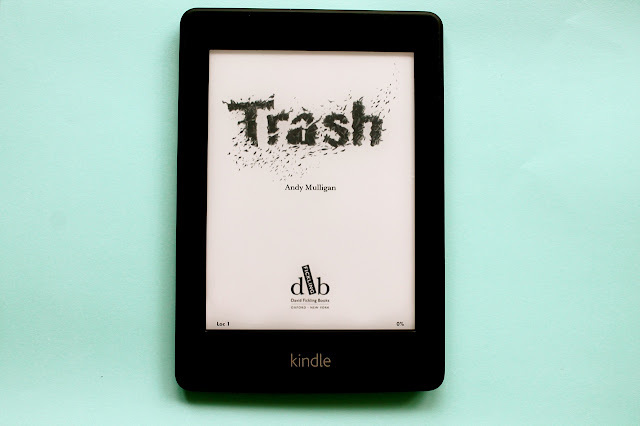 The book serves as the diary of the events which occur after one of the boys, Raphael, finds a bag on the rubbish dump. Unbeknownst to him, what is inside the bag is very valuable information which the police are in high pursuit of, and which eventually leads Raphael and his two friends into danger and onto adventure! I really enjoyed the way that the book was narrated, split up between the 3 boys, each taking their turn to tell their part of the tale. Occasionally we would hear from other characters too, helping to give a fully rounded account of events. It didn't take me long to read this book, partly because it wasn't very long and partly because I couldn't put it down! I was rooting for the main characters the whole way through, and was pleased when good was finally able to triumph over evil. I always love it when a book has a satisfying conclusion! This doesn't sound like the kind of thing I would be usually drawn to, but your post has intrigued me and I shall add it to the "to read" list, which I don't think ever gets any shorter! Thanks :) It's not usually the type of thing I usually read actually, I have been trying to read more of a variety of books and I have to say it has been great! Sounds really good, do you think it's suitable for my 12 years old son?